The industry’s most sophisticated forecast projects patient demand across the full care continuum year over year for the next decade. Reform ready and completely transparent, the Impact of Change (IoC) goes beyond population to model additional factors such as payment and policy changes, new technologies and readmission penalties. Available in 2 versions, the first allows you to see exactly how impact factors drive local market volumes for your hospital(s) and your competitors with a quick drag and drop, while the second is a national forecast that can be viewed by MS-DRG, disease, service line, procedure and care site. How is health care utilization projected to change in our market(s) and what are the key drivers besides population? Where are the inpatient growth opportunities, and which inpatient services are most at risk of shifting to outpatient or declining over the next 3 years? 5 years? 10 years? How will future inpatient utilization trends impact facility sizing (days and length of stay) and the demand for select services for my institution or system? How will DRG growth impact my future budgeting process? How is outpatient utilization projected to change by site of care and impact channel strategies in our market(s)? What role will the future demand for services play in determining market opportunity and our organization’s ambulatory footprint? 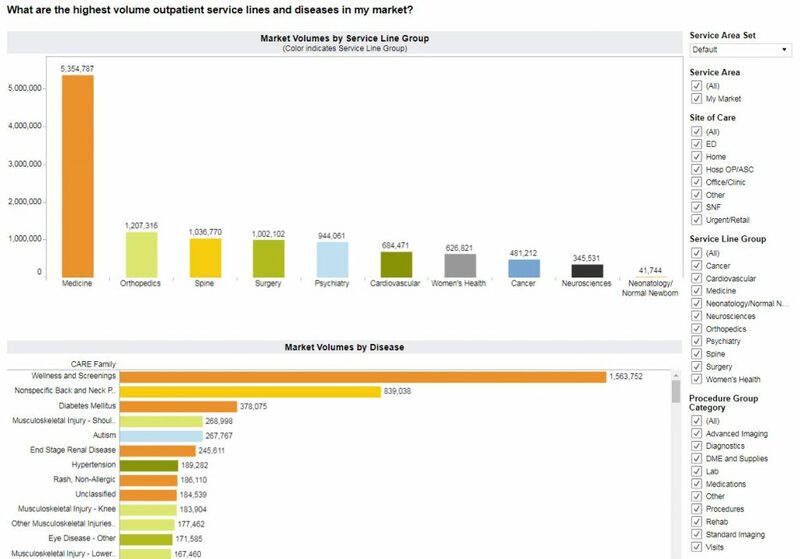 Assesses the size of your local market by service area, service line, disease, procedure and MS-DRG and displays inpatient market share trends over the last 3 years. What is the current size of my local market (eg, discharges, days)? How has this trended over time? Where are patients seeking care in my community? 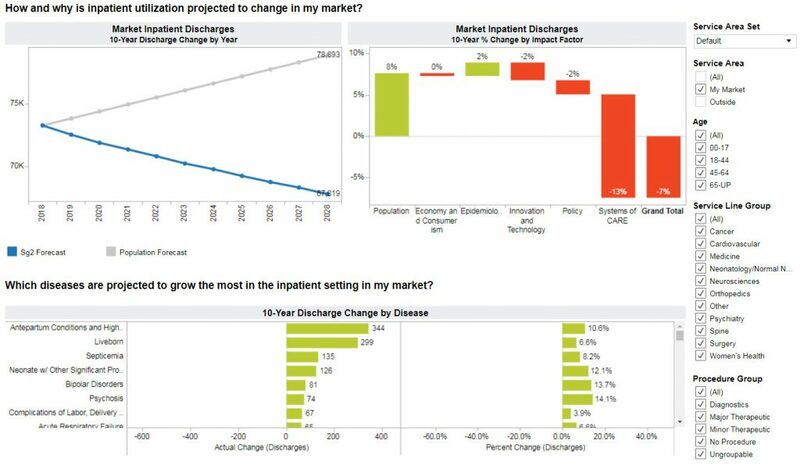 How is my inpatient market share trending over time? What are the highest-volume inpatient service lines, diseases and procedures in my market? Who is in- and out-migrating to/from my market for inpatient services? Is our share increasing in areas that we want to grow, such as surgeries? What does our share of PAAs look like compared with our competitors? Our organization is trying to decrease this utilization. Has this been playing out over time? What types of patients/procedures are leaving my market? Analyzes more than 400 million annual outpatient encounters to provide a snapshot of current utilization across your market. 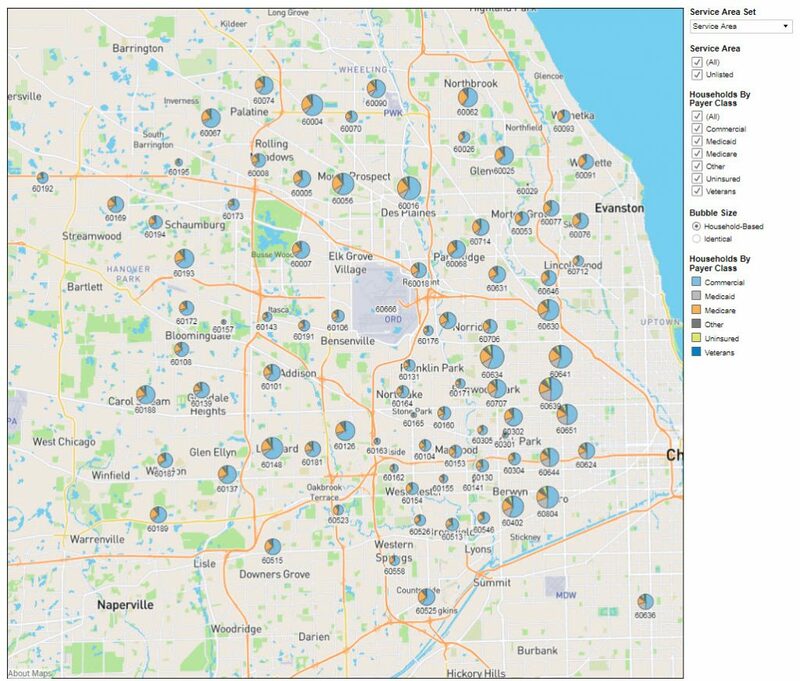 You can drill down into estimated volumes by service area, service line, disease and procedure to inform your strategic plan and business development activities. These volumes are also used in the demand forecast, eliminating the need to submit additional data to Sg2. What are the highest-volume outpatient service lines in my market? What are the highest-volume outpatient diseases in my market? What are the highest-volume outpatient procedures in my market? Where are services provided by site of care in my market? Provides current-year estimates of inpatient utilization (discharges and total days) across your market. Estimates are delivered at the MS-DRG, age cohort, gender and zip code level to inform your strategic planning and growth initiatives. What is the current inpatient demand for an area in which I do not currently operate or receive data (ie, across state lines)? What is the inpatient demand within my current market, which is data-challenged? Provides current-year estimates and 5-year projections for a variety of demographic factors, such as age, gender, income level, ethnicity and marital status, enabling you to understand and anticipate changes that impact your market. What is the current breakdown of the following characteristics by zip code in my service area, and how will they change in the coming years? 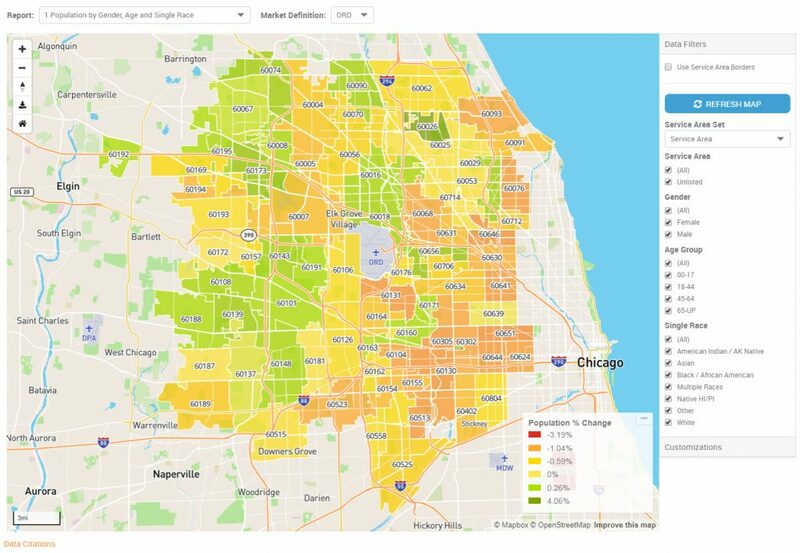 Quantifies the estimated distribution of households in your local market based on a wide variety of consumer behavior, along with key demographics, socioeconomic rank and urbanicity. How does social group affect buying behavior for people in my community? Where are certain life stage populations located in my market? 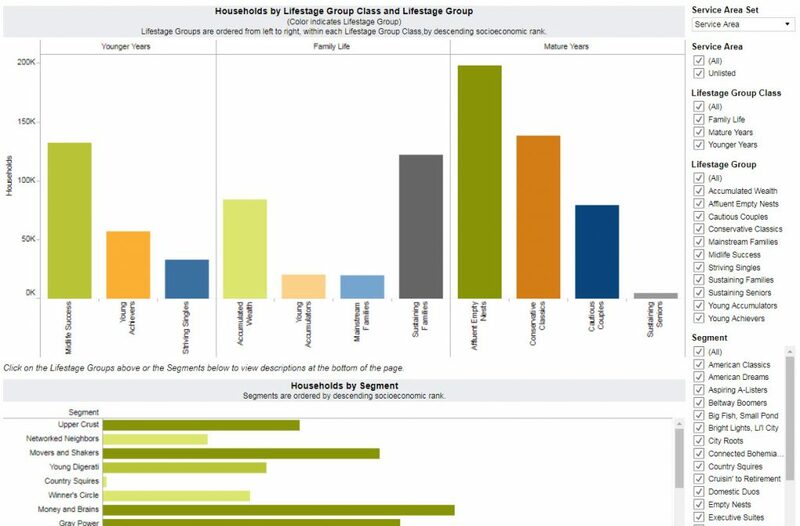 Segments the households in your market based on how they pay for health care services. Current-year estimates provide your market’s distribution of Medicare, Medicaid, commercial and uninsured households, along with additional, more detailed product breakouts. How do the households in my market pay for health care services? What is the distribution of Medicare, Medicaid, commercial and uninsured households in my market?